For the past 24 years, Cemil Tuncay has wheeled his small metal cart to the biweekly produce pazar in Edirne. He sets up shop around noon, lighting coals under what can be described as massive, torpedo-shaped sausages. 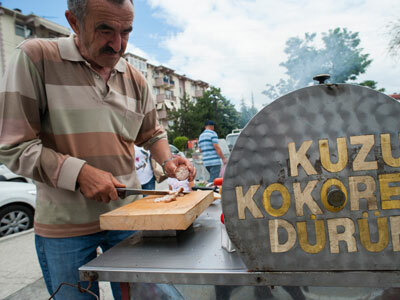 Kokoreç is a simple fast food made from bits of sheep leftover from butchering, stuffed into intestines to the bursting point. It is a one-man operation. With the exception of his wife (who sometimes helps him clean and prepare the meat), Tuncay goes it alone. His mustachioed face is often grizzled with a little bit of stubble and worn by years’ worth of fragrant grill smoke. He is tall and stoops over a bit to prepare each order, doing so with a jaunty smile and a twinkle in his eyes. There are really only two options to choose from: half or full portion. The standard sandwich features tomatoes and meat seasoned with kekik (an oregano-like herb), spicy red pepper flakes and salt. If you like, you can drink ayran as well, but that’s about it. The meat is fatty and sumptuous, gliding over your tongue with a peppery nip that screams for more.